When the time comes to give your family bathroom, ensuite or cloakroom a makeover, one of the first things to consider is your colour scheme. Over the years, bathrooms have seen many colour trends which have come and gone. From the ghastly avocado bathroom suites of the 1970s (a delight we acquired when we bought our house) to more neutral colour schemes, contemporary interior design trends have a major impact on colour choices … and these days, the colour of choice is grey. When you first think of grey, your immediate thoughts probably turn to dreary skies and drab winter days—surely as far from positivity as you can get. So, how has this usually dull colour become so popular for bathrooms? Why is grey a popular bathroom colour? Well, those horrendous coloured bathroom suites could well have something to do with it. Over the years, there has been a backlash against overly ornate or fussy bathroom designs. In-line with this trend, bathroom colours have become noticeably pared back. Minimalist design has become the go-to style, meaning a toning down of those louder, bolder colours for something infinitely more subtle, which is where whites and greys come into their own. Have you noticed how popular white metro tiles with grey grout are?! Another thing that makes grey a popular choice is its timeless appeal. As a more neutral colour, it won’t go in and out of fashion as much as a bolder shade like red, green or blue. It also works well with a range of different styles, from clean, contemporary designs to traditional bathrooms. So, if you’re looking to keep up with Jones’s and join in with the latest trends, I’ve come up with some great grey bathroom ideas. If you don’t want to mess with your walls and floors, an easy way to add grey is to pick out bathroom furniture in this shade. Replace your pedestal basin with a vanity unit and choose something with a grey finish, rather than the usual white or wood designs. If you simply want to add a dash of grey, why not look for furniture with grey handle inserts or accent colours? The great thing is, you’ll find different styles of grey furniture to suit both vintage and modern bathrooms—it’s a timeless shade after all! Industrial style bathrooms are very popular these days. If this is a look you love, why not consider creating concrete effect walls rather than adding tiles? It’s easy to do. Simply dry brush some lighter grey shades onto your wall (there’s no need to cover every square inch with paint), then use an old rag to daub darker grey over the top whilst the base layer is still wet. Then, blend it in using a dry brush. I’d love to give this a go on our bathroom! If painting isn’t your cup of tea, you could always fake it by picking out some grey brick effect wallpaper or grey tiles. Metro tiles and slate effect designs are both exceedingly popular choices. 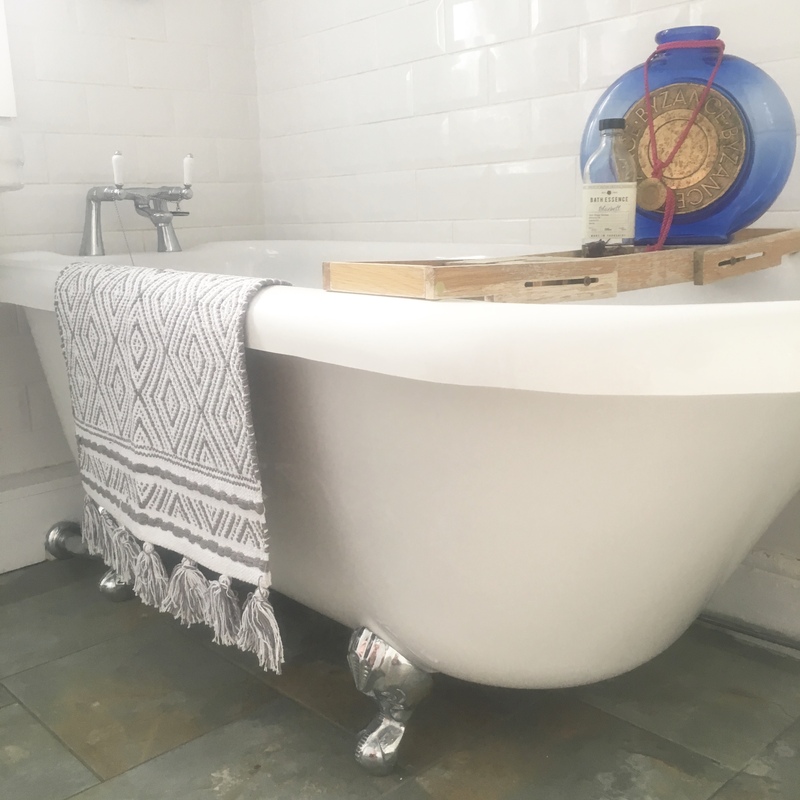 Whilst it may seem easier to create a grey kitchen, living room or bedroom, there are some more unusual ways to inject a shade of grey into your bathroom design, aside from furniture, walls and floors. If you are replacing your shower enclosure, why not consider a grey shower tray, rather than the more common white colour? You can also pick out a range of stone effect accessories which, not only add grey into your overall design, but give your space a more natural look and feel. There really are many, many shades of grey available to you, so there’s no reason why you can’t have a beautiful, modern bathroom with a monochrome colour scheme.